Those moments when I am at my computer or on the couch putting off my workout, I need to be reminded of how awesome I feel when I’m done exerting myself. 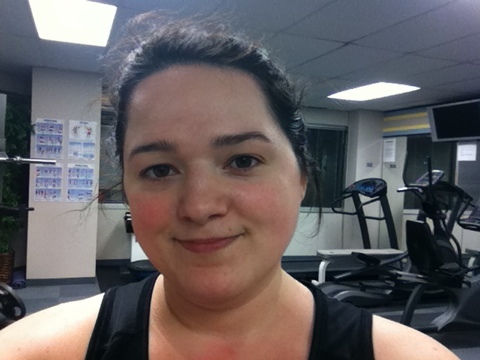 Happy post-workout face: December 28, 2011. I always feel cheerful and strong after a weights workout. I want to capture those moments post-workout to give me inspiration when I don’t have it, and what better way than with a photo? Here’s to remembering why it’s worth it to push yourself: the feeling of accomplishment as you wipe the sweat off your brow and take a long drink of cold water before heading home. This entry was posted in fitness and tagged Exercise, fitness, mood, motivation, Photos, weightlifting. Bookmark the permalink.